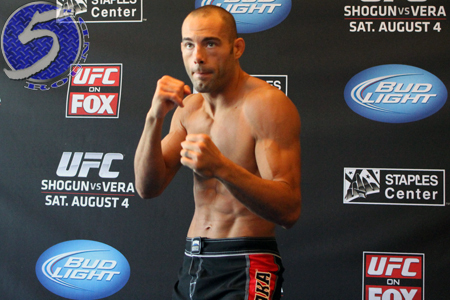 We caught up with Mike Swick (Pictured) at Wednesday’s “UFC on FOX: Shogun vs. Vera” media workouts to ask him about his former teammate’s statement. The two most interesting things we learned from our conversation with Swick was that, although he and Kosckeck entered the UFC together as contestants on the first season of “The Ultimate Fighter,” and trained with each other at AKA for several years, they are far from BFFs. Also, Swick didn’t seem to mind Koscheck’s statement because the AKA train is forging ahead just fine without him. Swick, who has been sidelined for the past 29 months with various illnesses, will be making his long-awaited return to the Octagon this Saturday against DaMarques Johnson. FYI – Swick had “AKA” plastered across his fight trunks.